I am so excited to be starting the Whisper Trilogy. As most of you know I am a HUGE fan of Meg Cabot's The Mediator series, and that I am halfway done with it and will not know what to do with myself once i finish it. This is the reason that I am so excited to have found Chelsea Cameron's Whisper Trilogy, because it reminds me so much of The Mediator Series. It is a perfect distraction for me. 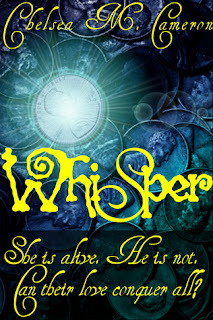 Although Whisper does remind me a lot of Meg Cabot's series, they are very different. Meg Cabot's series is very light and simple, but this trilogy seems to have taken on a much darker tone, and I really enjoyed it. The number one thing that I really liked about Whisper is the main character, Anna. I absolutely loved her personality and what I really appreciated is that there is a reason she is hiding her secret of being able to communicate with those who have deceased. I don't really like when there is a secret that a character is keeping from those closest to them, because they don't know how they will react to it. It makes me feel like the character doesn't have enough trust in those closest to them so it causes me to just want them to tell someone so they aren't alone with their secret. In Whisper Anna has told her parents before and they do not believe her. They threaten to send her to a mental institution in order to help her with her "problems". This is what I am talking about when I say "darker tone". It really makes the story feel more real, because in the real world when someone tells you they hear and see dead people, you send them to a doctor. It just caused there to be so much tension in the story with hoping that eventually Anna will have someone she can trust and talk to. I also really liked the pace of the book. Nothing seemed to happen too fast and was all pretty much worked out in the right amount of time. There is something awful that happens to Anna towards the end of the book, and it really made the book that much better. It is awful what happens, but it gave the story that huge dose of emotion that further connected the reader to the story and its characters. I absolutely love it when a book can make me physically show emotion, and Whisper definitely succeeded in making me cry. I absolutely loved Whisper. I am so happy to have found another book like Meg Cabot's The Mediator series so that I will have another set of books to read once I finish Meg Cabot's series. The main character, Anna, is completely loveable and makes the story feel very genuine. I really appreciated that Chelsea Cameron really let the book go down a dark path, because she could have easily made it a light, heartfelt read. It really puts the cherry on top when a book can make me physically show emotion, and Whisper did not disappoint. I will absolutely be continuing the trilogy, and I encourage you all to try this book.